You can't exactly cram a couple of 63" plasma screen TVs into your backseat to run your in-cab entertainment system. 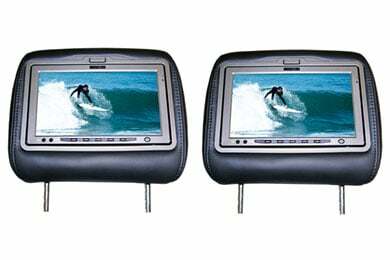 But, you can deck out your ride with massive Vizualogic A-1290 Headrest Monitors for a luscious visual experience. These headrest monitors boast 9" TFT-LCD screens, the biggest, brightest, and boldest monitors that Vizualogic makes. As ample in features as they are in size, Vizualogic A-1290 Headrest Monitors have the widest range of input options. Pop your favorite flicks into the built-in DVD players for a drive time double feature. Or, connect your iPod, MP3 player, game console or other digital device into the front-mounted auxiliary jacks. Best of all, each headrest monitor works independently, so your boys can stay occupied with Pokémon episodes while your girls watch McGee and Me. Best of all, your Vizualogic A-1290 Headrest Monitors are fully custom designed for a flawless fit in your vehicle, matching the shape, fabric and color of your stock headrests. These headrest monitors come with a pair of wireless headphones, but you can also pipe the audio right to your stereo through the built-in FM transmitter or hardwiring. 1-year warranty. Reference # 761-306-624 © 2000-2019 AutoAnything, Inc.